I was invited to speak at an elementary school to third year students about Barbary macaques for “Scientist in the School” Day. The aim of this program is to introduce students to different branches of science, challenge children’s perceptions of what a “scientist” is and does, introduce them to current issues, and get them excited about science. Barbary macaques were the perfect subject to achieve these goals. 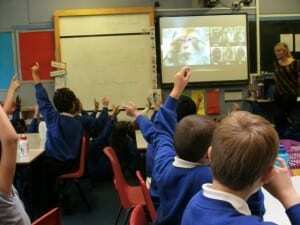 Students and teachers alike were very excited to learn about Barbary macaque ecology and behaviour and the work that the Barbary Macaque Project does. The students were extremely engaged and enthusiastic during my talk (including gasps when I explained that Barbary macaques do not have tails, a monkey with no tail?!) and were full of questions. Following my presentation we played a few rounds of a game called “Name That Monkey” where students identified pictures of individuals from the Blue and Green Groups, followed by a question period. Students then returned to their classrooms and I had the opportunity to speak one-on-one with them as they completed work sheets on Barbary macaque ecology. Their curiosity about the monkeys seemed endless as I answered more questions about what it is like to work with Barbary macaques, which monkeys are my favourite, and how to become a primatologist. I even heard a few declarations of “I want to be a primatologist!” before the day was over. 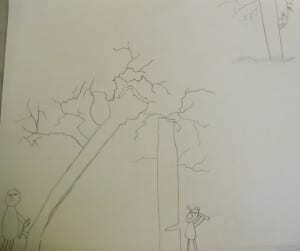 A drawing by a third year student depicting deforestation as one of the threats Barbary macaques face.